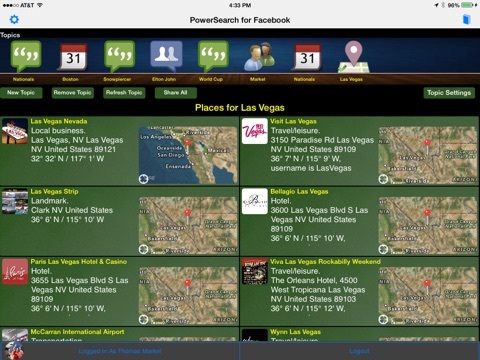 PowerSearch lets you search the Facebook Social Graph for posts, users, pages, events, groups, places and check-ins for any topic of interest. Search for upcoming concerts events (e.g. 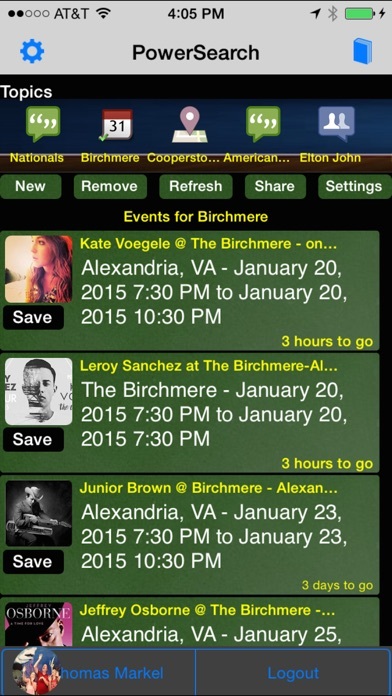 The Birchmere), conventions, sporting events, artist pages, locations, specific users or posts on any topic. 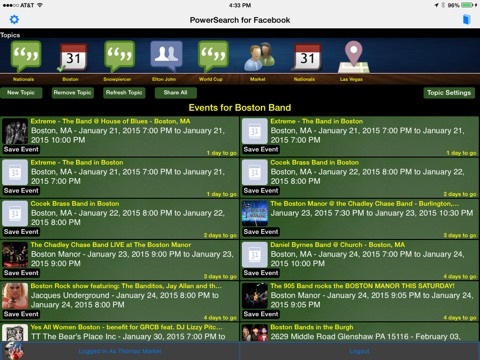 Save events to your calendar so that you are notified when they occur. Posts are now only your feed posts because of a change to the Graph API. Messages including links, phone numbers, addresses and calendar events/dates are clickable. All created "Topics" are represented with icons at the top of the display. To access a Topic, click the topic's icon or swipe left or right for desired topic. On start-up all Topics are "run" to reflect current information on Facebook. You can also query a desired date range, if you like. 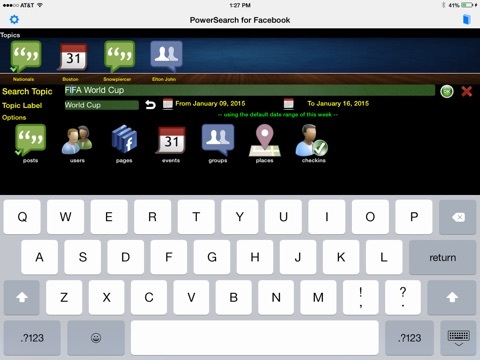 Topics are saved for each logged-in Facebook user. All results include a user Facebook profile image and resulting text. Place results also include a map. Clicking the user image gives you the option to go to the home page, view the full message or view the best profile picture for the user. Clicking the document icon, before the text, will go to the actual post, user, page, event, group, place or checking information in Facebook. Clicking the share arrow icon in the upper right-hand corner of the result, is used to share the information using Email, Twitter, Facebook, SMS, clipboard, and many more.. When you start-up if there are no Topics, you will be prompted to enter a search topic (any topic or text) and an option. Enter a search topic and select an option to indicate the type of Facebook information to search. To run and save the Topic, select the check mark. 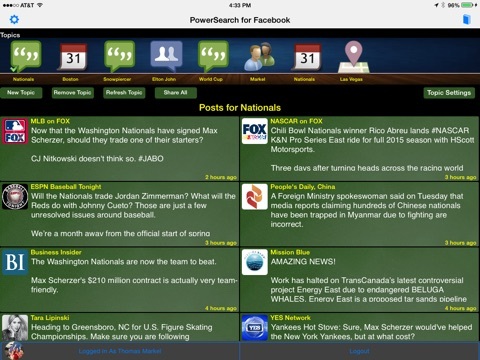 The saved Topics are indicated by thumbnails at the top of the screen by 'Topics'. To reorganize the Topics, simply drag 'n drop a thumbnail to the desired location. 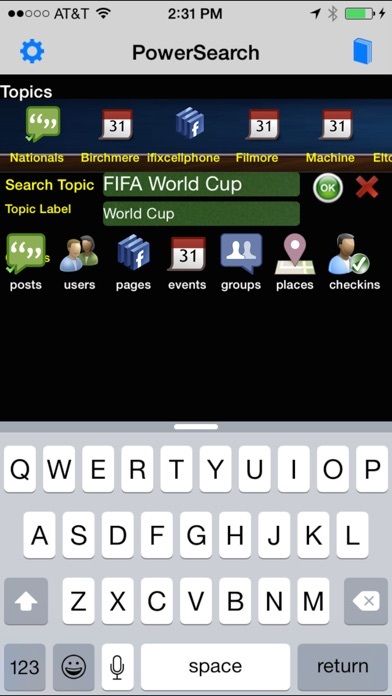 To see a specific Topic, select the Topic thumbnail or swipe left or swipe right to go to next or previous Topic. To remove a Topic, drag the thumbnail up quickly and you will be asked if you desire to remove the topic. 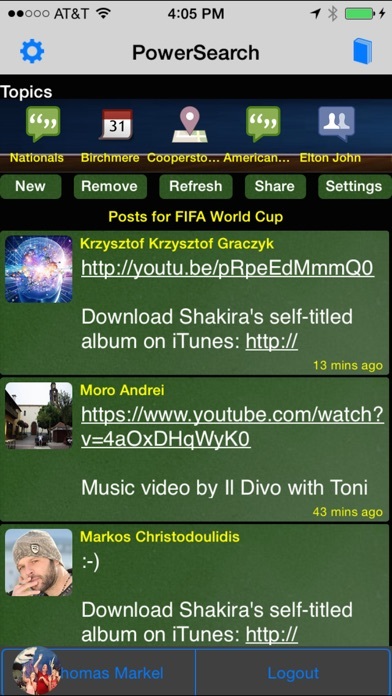 On start-up, all saved Topics are run automatically. Use app settings, upper left-hand corner to clear saved Topics on start-up, if desired. Selecting a Topic will show you that Topics details. To remove an existing Topic, click the Remove Topic or dragging the Topic thumbnail up. To add a new Topic, click the Add Topic button. To refresh results, click the Refresh Topic button. Use the Topic Settings button to change your Topic's settings. Selecting the check mark again to accept will rerun the Topic. The options for searching Facebook are users, pages, events, groups, places and check-ins which indicates what type of things you want to search when searching Facebook. 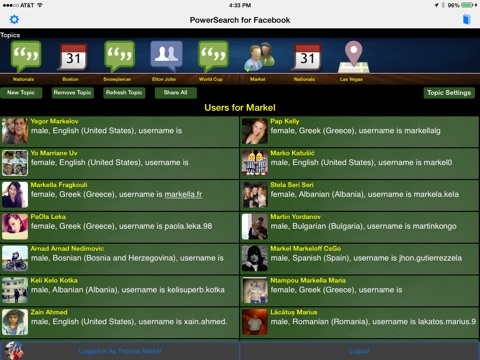 Users searches all users in Facebook. Pages searches all individual pages, e.g. artist and user pages, in Facebook. Events searches all events, e.g. concerts, in Facebook. Groups searches all groups, e.g. fan clubs, defined in Facebook. Places searches all places, e.g. businesses, defined in Facebook. Check-ins searches all user check-ins in Facebook. Places results include a map if the location latitude and longitude is known for the place. The map displays the place's location marked with a red pin and your current location with a blue dot. The map displayed will also have a location icon in the lower left-hand corner, which if clicked, will display the location in the map app so you can see more details and street view, if available. Use Settings 'Use Elapsed Time' to indicate the format of post times displayed. The default is to display elapsed time, however, exact time can be shown. Notes: Events always show actual time. Use the Settings 'Clear Saved Topics' to clear out all saved Topics when starting, if you desire to start from scratch.